Scholars’ Mine is the institutional repository for the Missouri University of Science and Technology. Scholars' Mine provides access to the digital scholarly and cultural resources created by the university community. This includes faculty papers, departmental publications, conference proceedings, graduate student works, and other scholarly material, as well as campus cultural and historical works. 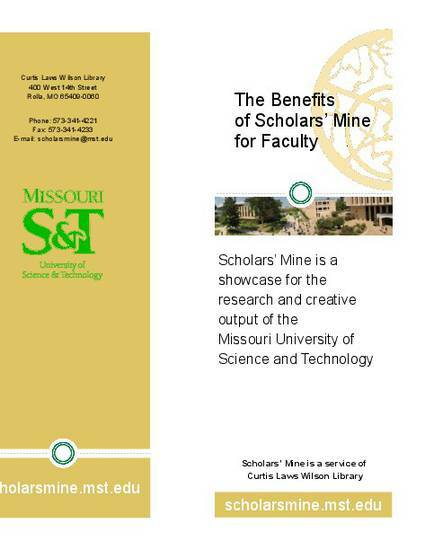 This document is an education brochure outlining the benefits Scholars' Mine provides to Faculty at the Missouri University of Science and Technology.